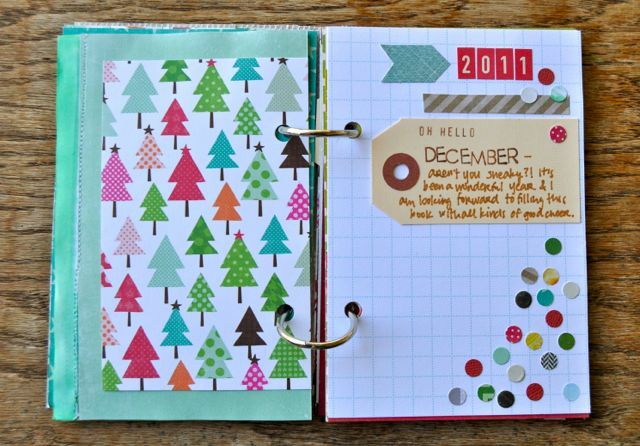 Last year I professed I was doing it, and by doing it, I meant participating in Ali Edwards' project - December Daily. To my surprise (and delight), I actually completed the project all the way through. Well, all the way to the 25th of December, which counts in my book. The plan is to keep much of what worked the same for this year. The small format - 4"x6", bound with 2 rings worked, so I chose the same size for this year. Using up much of my stash was the main goal. I went through the Christmas themed items, choosing most from Echo Park, American Crafts and Hambly. 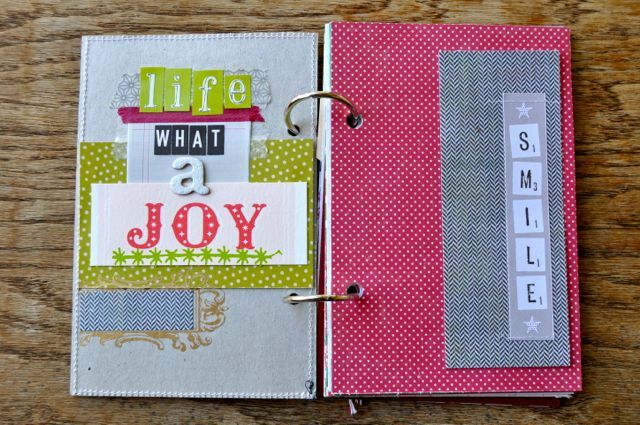 And threw in some others from Jenni Bowlin, Crate Paper, and Studio Calico. For the cover, I began by adding gesso to a thick piece of packaging. While it was drying, I wrote the word December in white gel pen and poked the holes and hand-stitched it. I used metal stamps for the 2011 circle, punched the heart from a scrap that got some white mist on it. Then I punched the green sheet with a Martha Stewart punch and haphazardly layered on the bits. Admittedly, I went a bit overboard and crammed in a mix of items that may not go so well together. Oh well. 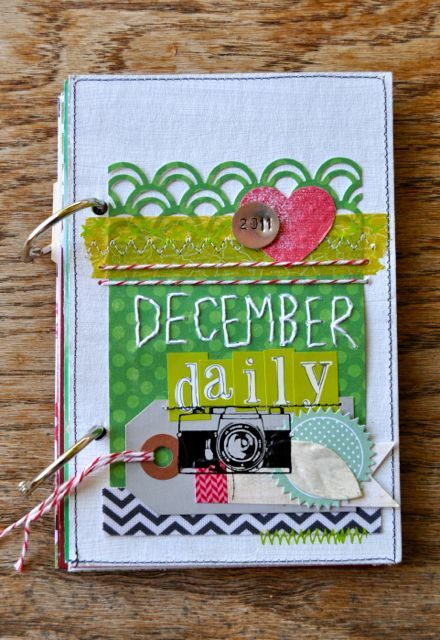 December Daily banner (which will show up on all related posts this year is from Rhonna Designs Christmas kit). Sticking with a simple plan of 1 or 2 pages per day depending on what happens, and 1 photo - either Instax or Instagram. If I end up with more, great, if there is less, that is fine too. 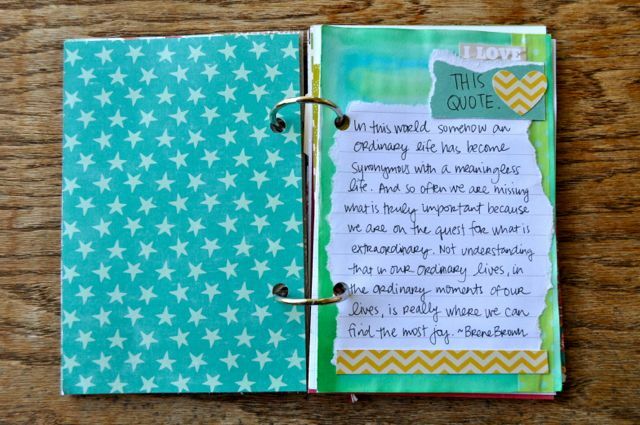 My plan is also to include magazine cutouts and bits from mailers and other fun finds. My main motivation is to get it documented and done, while enjoying the process. Love Ali's advice on being realistic and making stuff when you can. Oh and having fun with it. That's what I did last year and that's what I plan on doing again this year. How about you - are you joining in on the fun too?